According to UNESCO statistics Jules Verne is the third most translated novelist of all time, right after Disney Productions and Agatha Christie. Thinking of Jules Verne the most common associations are fantasy, science fiction and life-changing adventure. As a child Jules Verne was very interested in travel and exploration, which later become a passion he expressed through his adventure and science fiction tales. His father was an attorney, and at first Jules Verne studied the law. During this time he started writing light comedies and operettas for the theater, but as soon as Jules' father heard of this, he withdrew his financial support. What followed were years of life as stock-broker, a job he was not fond of. During this period he met the writers Alexandre Dumas and Victor Hugo, who offered him writing advice. Dumas and Verne became close friends. The biggest change in Jules Verne's life came as he met Pierre-Jules Hetzel, one of the biggest French publishers of the 19th century, who had also published works of Victor Hugo and Georges Sand. Verne offered his work to other publishers before Hetzel, but it had always been denied with the explanation that it was too scientific. Hetzel helped Verne rewrite various aspects of the story, change the tone and then published it in 1863. That was Verne's first novel "Cinq semaines en ballon" (Five Weeks in a Balloon). From that day on Hetzel published about 2 or more of Verne's works per year. What followed was many of his best works, collectively known as "Les voyages extraordinaires" (extraordinary voyages) and Jules Verne could finally live off his writing. 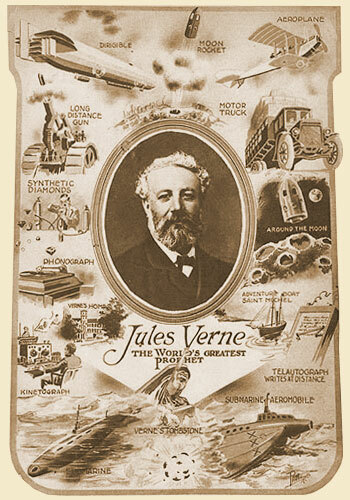 The term "prophet", even if slightly exaggerated, is still not far from the truth, considering how many modern inventions were mentioned and described by Jules Verne in his works. Some of those are the television, automobiles, air conditioning, submarines, helicopters and jukeboxes. In 1887, after Verne's mother and Hetzel died, his work became darker. One possible explanation is that Hetzel's son, who inherited the publishing business wasn't such an eager editor as his father had been. Hetzel Senior's changes to Jules Verne's style had largely to do with his stories having a more optimistic tone. A year later, in 1888 Verne was elected town councilor of Amiens, and he successfully served for 15 years. He was ill with diabetes and died in 1905. Jules Verne was born on February 8th 1828 as the first of 5 children, in Nantes, France. He wrote a lot during his youth, however his first novel "Five weeks in a balloon", was published in 1863, so when he was already 35 years old. In 1857 he married Honorine Deviane, a widow with 2 children. 4 years later his first and only child was born: Michel Jean Verne (a boy). After some years in Paris and Auteuil, he settled in Amiens when at the age of 43, where he remained until his death in 1905. The Madeleine cemetery in Amiens holds his and his wife's tomb. Both their names are written on it. 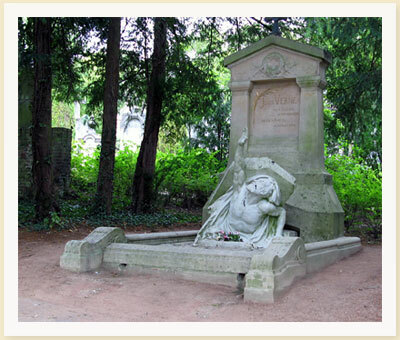 In 1907 a sculpture designed by Albert Roze, who was a local sculptor, was placed on the grave. It depicts Jules Verne coming out of his tomb, with his right arm raised towards the sky. The title of the scuplture is "Vers l'immortalité et l'éternelle jeunesse" (To the immortality and eternal youth). Out of Jules Verne's complete work, his 54 novels from "Les Voyages Extraordinaires" are what he is mostly known for. The dates are of the first or most common translation to English.